The windows in the cafe are impressive. I just love the massive top to bottom original windows on Level 1 of the QVB. As I sip tea and chat, they allow a birds-eye view of the Westfield Tower wedged in amongst the high-rise buildings. The opera music competes with the murmur of the diners and is pleasant rather than offensive, even if you’re not a fan. It’s just hit lunchtime when I visit, but the service is swift and efficient, a Viennese trait perhaps, and we’re not waiting long before we’re munching on scones. I’m not keen on yellow plates, I don’t now why but they just don’t suit, they remind me of 1970s Formica laminated kitchen bench tops. Overall, the presentation, quality and taste is pretty average. 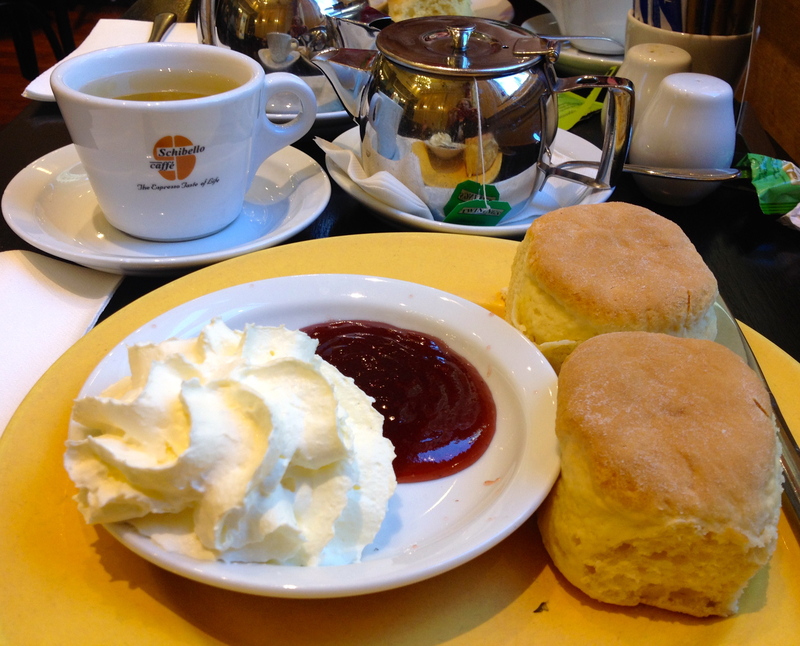 The scones are neither good nor bad, and the cream is very light. My friend and I can’t decide whether it’s from a can or from a cream whipping canister, but after much debate we decide on the latter as it does taste fresh but very light. The jam is my favourite part of the spread, not too syrupy, but tasty nonetheless. Tea: A small selection of Twinnings tea bags served in a small pot. Overall: Efficient service but don’t expect to be transported to Vienna, Austria.